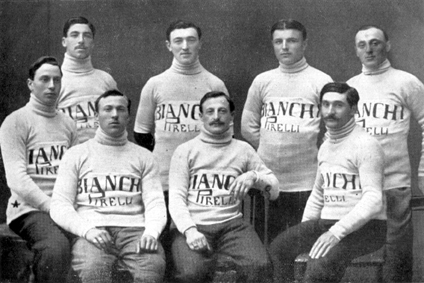 The General Classification of the 1911 Giro was calculated using points rather than accumulated time. To celebrate the 50th Anniversary of Italy's unification, the Giro started and ended in Rome. The 1911 Giro had a climb higher than 2,000 meters for the first time when it went to Sestriere in stage 5. The team affiliations listed are my best shot at resolving conflicting sources. Armando Cougnet acquired sole ownership of La Gazzetta dello Sport from Emilio Costamagna. He would own it until 1922 when a group of investors purchased the paper. This would be a good time to describe the bikes used by the top professionals of the era. They were generally single-speed, fixed-gear machines. The frames were lugged and made from mild steel tubing. Cranksets were steel and secured to the bottom bracket axle with a tapered steel cotter, a design that survived into the late 1970s on European consumer bikes. As mountains were added to race routes, fast descending was as important as speedy climbing. A fixed gear was a real impediment because it forced the riders’ legs to spin as the rear wheel turned the cranks. Early riders either removed their feet from the pedals or limited their downhill speed to what their legs could handle. Freewheels, which had been available since 1898, began to appear on racers’ bikes after 1906. It was felt, quite correctly, that a fixed gear was the most efficient setup and early riders preferred to use one instead of freewheels whenever possible. Around 1910 riders started using bikes with dual-sided hubs with two different sized cogs. A rider could change gears by dismounting and flipping the rear wheel around. Eventually the rear hub would have four cogs, two on each side. Now a rider could climb a mountain in a lower gear, stop at the top, flip the wheel to a smaller cog or freewheel and descend with a higher gear ratio. Deciding when to stop to change gears became an important part of the era’s tactics. A common gearing of the time was an inch-pitch 22-tooth front ring with an 11-tooth rear cog. This would translate in the current half-inch system to a 44 x 22. The ratio seems low for a professional but as Peter Joffre Nye showed in Hearts of Lions, early riders could ride with a very high pedaling cadence. Toe clips were used early on, but toe straps locking the rider’s feet to the pedals began to show up only around 1907. Wheel rims were made of wood with tubular tires glued to them. Brakes were terrible. At first they were pads that rubbed the top of the tires. Caliper brakes made of stamped steel actuated by a lever pulling a cable eventually became common. Rough, muddy roads necessitated large clearances between the tires and the frame and fork. The long-reach calipers required by these frames meant that brakes had little mechanical advantage compared to today’s brakes. Brakes on a 1911 bike just didn’t work very well. Modern bikes have a wheelbase of about 1 meter. Early bikes had wheelbases of about 1.2 meters with lots of fork rake, or forward bend to the fork blades. The fork rake was generous for two reasons. First, the roads were usually unpaved and the spring of the extra rake was needed to soften the impact of the appalling roads. Also, with the laid back angles of the early bikes, more rake was needed to keep the trail—caster, or force keeping the bike going straight—correct for good handling. It is a commonly repeated error that early twentieth century professional racing bikes weighed 20 kilograms (42 pounds). The eminent British cycle historian Derek Roberts told me that that at the turn of the century bikes were available to the public that weighed about 28 pounds. Reynolds of England had patented the process of butting steel bicycle tubes (thinning the tubes away from the joints) in 1898. When French historian Jacques Seray writes that the top pros of the pioneer era rode bikes that weighed 11.5 kilograms (25.5 pounds) it makes sense. That’s exactly what one would expect a mild-steel, lugged track bike with steel cranks and sew-up tires to weigh. We have a good picture of Dario Beni, winner of the first stage of the 1909 Giro, riding in the 1910 Giro. His front brake is a friction pad that rubs on top of the tire and his rear brake is a then-modern side-pull caliper. He is using both toe clips and straps. Beni wears wool shorts that reach almost to his knees as well as a long-sleeve wool jersey. Cycling caps hadn’t become standardized and Beni wore a double-brim cap that protected his neck from the Italian sun. He had a bag mounted on his handlebars to carry food. A tire pump was mounted on the seat tube and he carried a spare sew-up tire looped over his shoulders. The roads were usually unpaved. Dust, mud, potholes, cobbles, rocks, chickens, cattle and sheep were regular obstacles. This is why you nearly always see pictures of early racers with protective goggles. In the mountains and in southern Italy conditions were especially primitive. Mountain passes were often tracks that were little more than footpaths. The Giro was maturing quickly. The 1911 edition had twelve stages totaling 3,358 kilometers. Race organizers were getting a better feel for the sort of demands they could make on the racers. For the first time the Giro would climb higher than 2,000 meters by sending the racers through Sestriere in the Alps in stage five. In 1905 the Tour had begun to include serious ascents, but nothing like the giant climbs of the Alps and the Pyrenees. It would not be until 1910 that the high Pyrenees would be part of that race. Although mountain stages are now the highlight of a stage race, back then they were considered a daring experiment, one the organizers were not sure the riders could handle. The high climbs dramatically improved the racing and fans went wild over the new challenge. Given the relentlessly hilly nature of the Italian peninsula, keeping climbing out of the Giro would have been nearly impossible anyway. To celebrate the fiftieth anniversary of the unification of Italy, the race started and finished in Italy’s capital, Rome. The 1911 edition was more of a real tour of Italy because for the first time it went all the way down to Bari in southern Italy. The peloton was overwhelmingly Italian. Italy’s best stage racers were on the line in Rome: Galetti, Gerbi, Rossignoli, Ganna, Pavesi, and Corlaita and were divided among five teams: Atala, Bianchi (to which Galetti had transferred), Fiat, Legnano and Senior. There were just three French riders: Petit-Breton, Maurice Brocco and Omer Beaugendre. Beaugendre may be forgotten today, but in his day he was considered a fine rider, having won Paris–Tours in 1908 and getting second in the Tour of Lombardy in 1909. Sports writers felt that Petit-Breton was the class of the field and the favorite to win this third edition of the Giro. 1911’s first Giro stage headed north from Rome through Umbria, finishing in Florence. Galetti made it clear that he hadn’t lost his touch by winning the stage with Rossignoli second. Through the next three stages Galetti and Rossignoli fought a hard duel for leadership. Meanwhile Petit-Breton had been riding unspectacularly but consistently. Of the 100 starters, there were now only 41 riders left in the race. Galetti had won two stages and Rossignoli one. As the riders entered the Chisone Valley they encountered a narrow road of horrible mud. Petit-Breton began the ascent at the front of the broken peloton. Already some of the riders had decided to walk their bikes. Well into the climb near the town of Fenestrelle, the riders ascending the east-facing slope, the Frenchman suffered an inexplicable loss of strength and was barely able to pedal his bike. First Ezio Corlaita and then others passed him as he struggled over the snow-covered summit. Most of the racers were by now walking their bikes. Recovering from his sudden weakness, and descending at an extraordinary speed with little regard for his skin, Petit-Breton caught the leaders. He was able to beat Galetti, Corlaita and Rossignoli (in that order) in the sprint in Turin. The final rush was really only between Galetti and Petit-Breton; the others were distanced by several bike lengths. Rossignoli remained the leader, but now tied at eighteen points with Galetti. The Giro then headed south. After the ninth stage, even without winning any more stages, Petit-Breton was in first place, the first foreigner to lead the Giro. Rossignoli was tiring from fighting his relentless duel with Galetti. Arriving in Bari in stage ten, Petit-Breton found himself in the winning break, but of the six, the other five were Bianchi riders and dealing with that kind of opposition was beyond a rider of even Petit-Breton’s gifts and Galetti won the stage. Galetti’s win allowed him to once again retake the lead, and now Petit-Breton, having come in sixth, found himself in second place. Petit-Breton crashed in stage eleven while still in second place. Again he was unable to finish the Giro. Nor did he ever finish the Tour de France again, despite having been first to win it twice. In 1911 he abandoned the Tour after the first stage. In 1912 he made it to only the second stage. 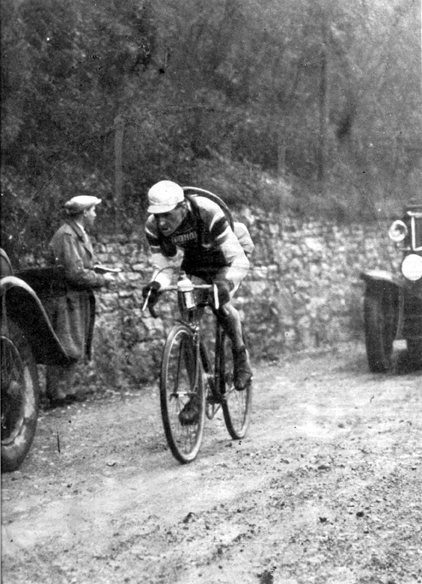 In the 1913 Tour, after a string of high placings and in second place, he left after the fourteenth stage. In 1914, he failed to finish the Giro’s first stage, and quit the Tour after stage nine. The eleventh stage, going from Bari in southeastern Italy to Naples in the west, was run over a course that could only be described as appalling. The atrocious roads often crossed streams that had to be forded. When the roads were dry, the dust was awful. The final indignity came when the peloton was chased by a herd of angry water buffalo, which in southern Italy are the source of milk for mozzarella cheese. Tired, dirty and miserable, the riders decided to end the stage at Pompei, a few kilometers before the finish in Naples. The riders then made their way to the official finish line in Naples where thousands of fans celebrating the fiftieth anniversary of Italy’s unification were waiting for a brilliant sprint finish. Disappointed at being deprived of the spectacle, they threw tomatoes at the riders. After that small riot, it was determined that Galetti was still leading the General Classification and with Petit-Breton’s withdrawal, Rossignoli was now sitting in second place. Ezio Corlaita won the final stage into Rome, but Galetti, who came in sixth that day, became the Giro’s first two-time winner. His Bianchi teammate Rossignoli would again have won if the standings had been calculated using time instead of points. This time Rossignoli’s elapsed time was 34 minutes better than Galetti’s.